Please read the following – important information relating to this weekend’s competition. Please arrive by 8:45am to allow time to warm up before the confirmed start time of 9.30am. The Sprints & Flags events will be first, followed by the surf events. There will be a number of sprint courses, flag courses and surf courses so it is vital that competitors stay in the event area that their age group is racing at all times as races will not be held up for missing athletes. Officials: Each county must provide officials separate to referees to help with the running of the competition. We ask that counties provide a min of 2 and that counties with larger numbers of competitors provide extra officials. Juniors: During the Nipper competition on Saturday there will be a requirement for safety in the water and we are asking that any counties who have older Juniors/Youths present on the Saturday to get them to assist the safety team in the water by spreading themselves across the water courses. As the Juniors are competing on the Sunday we are asking for as many as possible so that the day can be split between them on a rota basis so as they don’t have to do the full day. When the beach events finish we will call for these Juniors so if they can come to the safety team than that would be great. Parking: Please use large Carpark to the rear of the 2nd Lifeguard Hut. (Marked on Map Attached) The Council have been asked to open the barrier to this carpark. 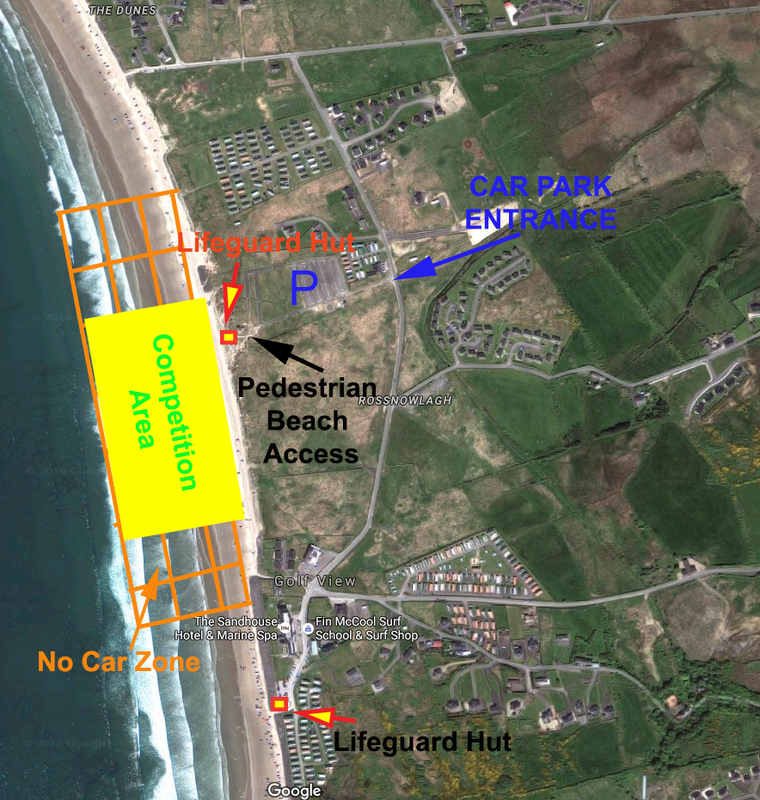 As Rossnowlagh is a Tidal Beach and the tide will be rising during the day, we recommend the use of the car park. Under No Circumstance are vehicles to enter the No Car Zone other than those authorised for the Set Up and Break Down. Directions: Follow the Ballyshannon/Bundoran bypass N15 until you reach the roundabout at the North of Ballyshannon with the Tall monument in the middle of it. At this round about take the exit signed Rossnowlagh, the R231. Follow this road for approx. 9Km to the Rossnowlagh Crossroads. Turn left and follow this road for approx. 1.3Km to the ‘T’ Junction at the Sand House Hotel. Turn right here and continue straight for approx. 0.8KM the carpark entrance will be on your left. See you all there tomorrow morning at 8:45am.